That's my hand in the picture to the left. Don't you think it's attractive? I figure out of all the thousands of people who read this blog each day that at least one or two of you must know a good talent agent that represents specialty models. I don't have any experience, but I think I'm ready to start moonlighting as a hand model, a la George Costanza, Ray McKegney, or J.P. Prewitt. I currently live in the Philly metro area, but I'm willing to travel. Just click on my name in the "Contributors" section in the right side bar for my contact info. Thanks for your help, everyone. Maybe your talent agent friend will slip you a little finder's fee or something. Actually, I was trying to make the jar look more full by holding it over my head and shuffling the little bit that was left toward the front of the jar. Sonia and I pretty much polished it off over the weekend and we forgot to take a pic of the jar until just now. But anyway, I figure it adds a bit of visual variety to our blog, right? I mean, we have great outdoor shots of TJ's foods, courtesy of Russ and Sandy. We have shots with cool tile backgrounds, and shots with hardwood backgrounds, but up to this point, I don't think we've had any featuring our hands. Now we do. This is a great sweet salsa. I think the biggest problem I've seen with other sweet salsas is a tendency to either taste too much like fruit and neglect the salsa-y part of the product, or the exact opposite of that. I'm always looking for a balance. 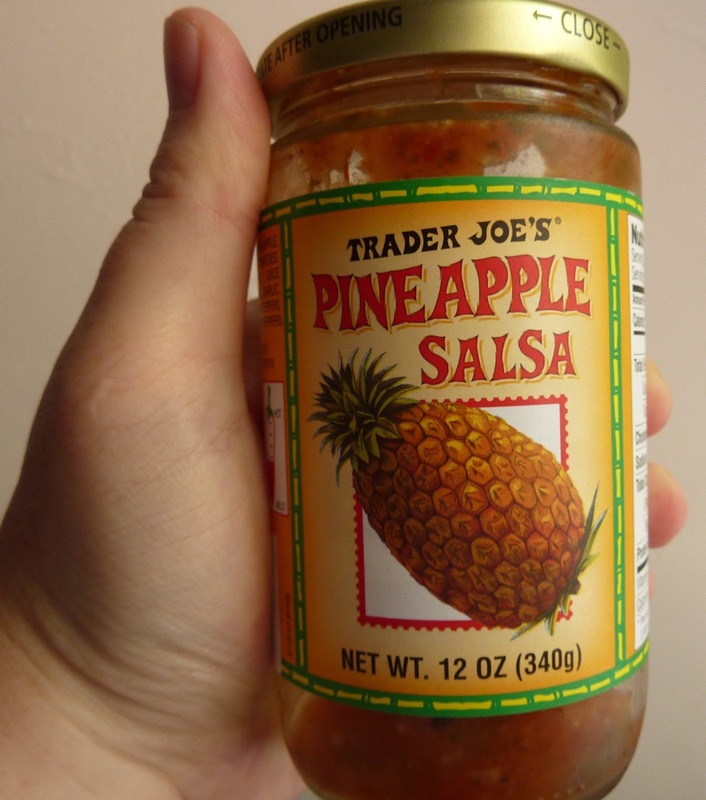 And while this product didn't taste super pineappley in my opinion, it did have a nice balance of traditional salsa flavor and sweetness. 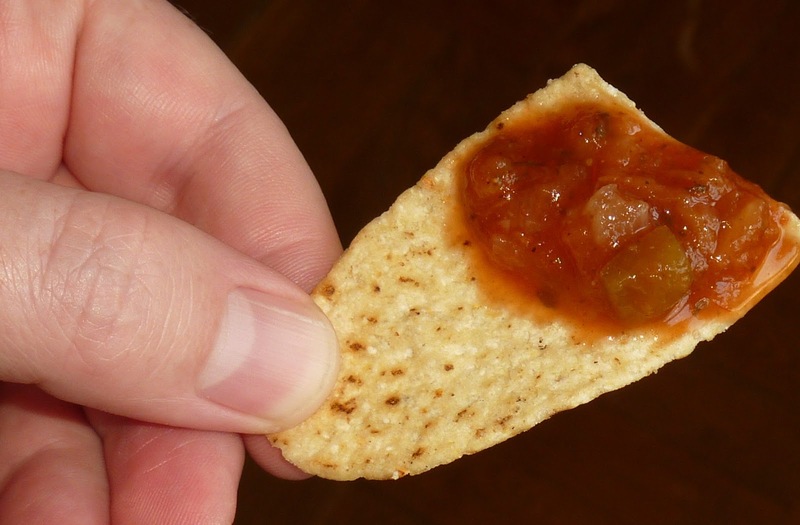 The spice-o-meter on the jar makes this salsa look medium, but it's most definitely mild. We ate it with the Longboard Chips, and they paired up quite nicely. This stuff would be great for a luau-themed pool party or some other such tropical-type gathering. Break out the leis and coconut bras! My only complaints are: not enough heat and not enough actual pineapple flavor. Also, we went through this $1.99 jar really quickly. It would be great if there were a larger size. But in its favor: it's nice and sweet, yet it still tastes like salsa and it pairs up perfectly with white corn tortilla chips. Four stars from me. Same from Sonia. Haven't tried this but just opened a jar of Trader Joe's Peach Salsa. 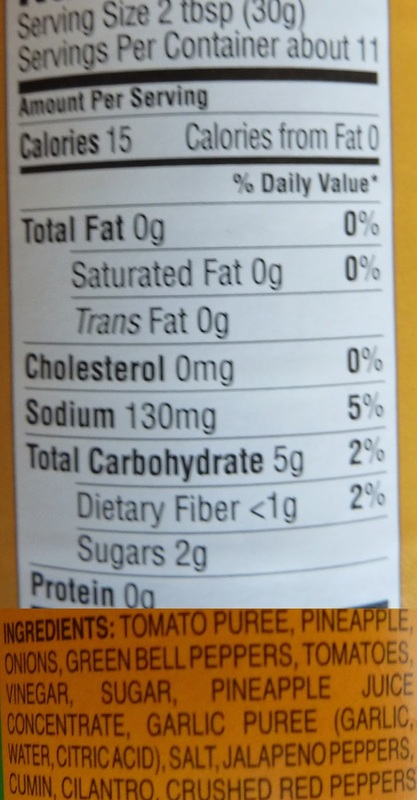 Way too sweet (4 g sugar - the pineapple has 2). Says it's medium hot, but it was way mild. Just added a bunch of Yellowbird habanero sauce to it. Terrible! Too sweet, no bite and even though it supposedly doesn't have chili powder I can taste which ruins the flavor.